The motor vessel Circassia, the third Anchor liner with that name, was launched at Fairfield Shipbuilding & Engineering, Glasgow, in June 1937. Her maiden voyage, in October of that year, was from Glasgow to Bombay, the route Circassia served for her entire commercial career. 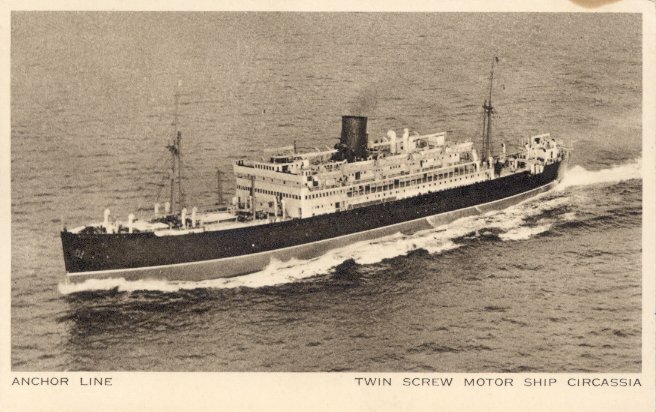 During World War II, she was converted into an armed merchant cruiser in 1940, then into a troopship in 1942, and finally into an infantry landing ship in 1943. Circassia returned to Anchor's Bombay service in August 1947, and on 13 January 1966 made Anchor's last passenger sailing on that route. She was broken up later that year. Circassia was the sister of Cilicia and Caledonia (V).